It was a wild wild week for major US markets and many leading stocks. After falling hard we saw a bottom late Monday and we were lucky enough to buy several leading fast movers late Monday and we saw them rise sharply into Thursday where we didn't nail the top and gave back some profits but all in all, we had a great week. If all goes well this week, we may see another low come in late Monday again where we can get a couple or few days of sharp moves higher again. This remains a cash market except for some short-term trades such as these. There is large money to be made here but you've got to be quick and not overstay your welcome. Had we held our trades past an hour or so into Thursday we'd have given back all our gains and then some. You really can't argue with the market ever, and doubly so when it's as volatile as it is these days. The precious metals didn't do much on the week with the exception of palladium. 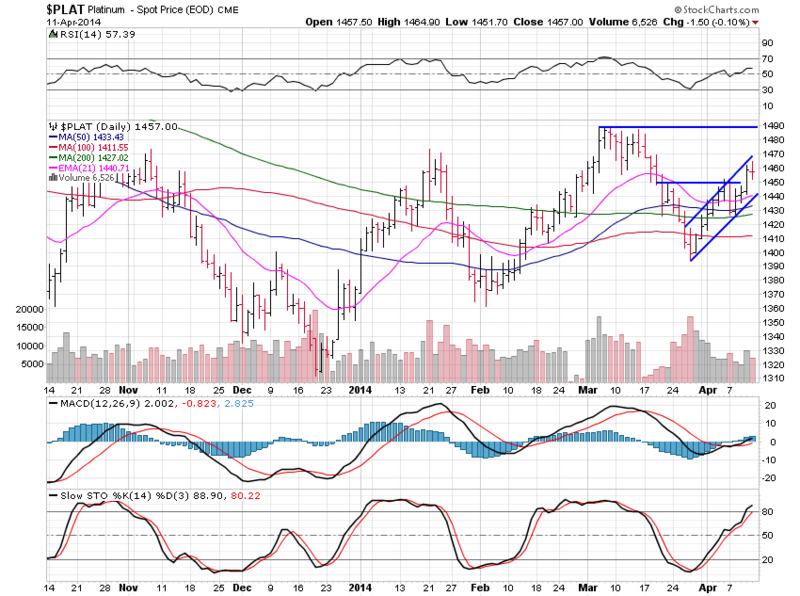 Let's take a look at the charts and see what needs to take place to get gold and silver moving higher. 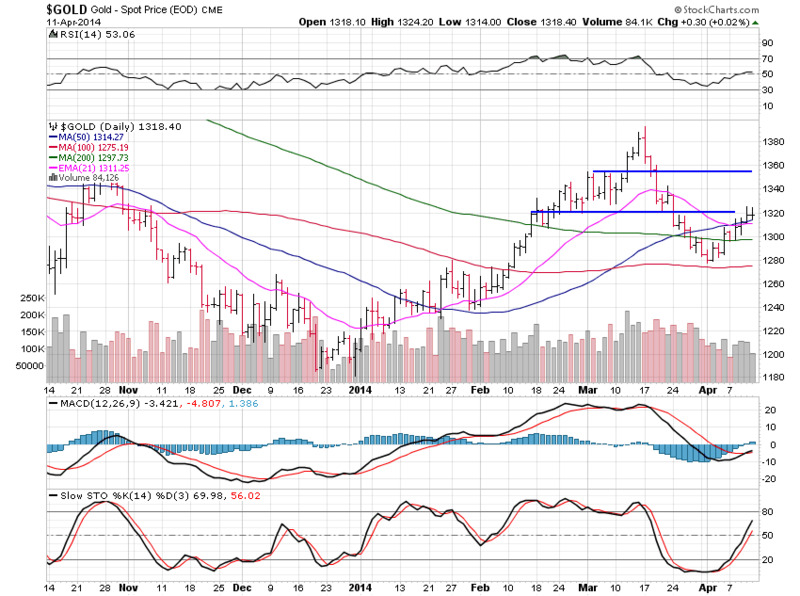 Gold rose 1.24% for the week and is at small resistance now at $1,320 as I said would happen last weekend. 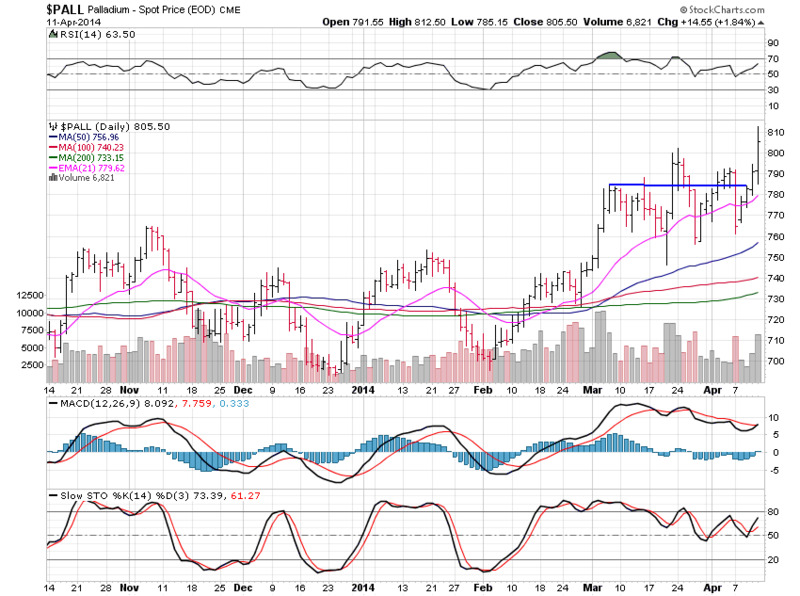 It's a tad early to say this but we could be about halfway through setting up a cup and handle pattern here. If we move up to the $1,360 area and then build a handle we will have an excellent trade setup. Until then I'm not going to touch gold. Half of this game is waiting for the right time to enter trades. Silver only gained 0.03% this past week and still has the bearish look to it. This channel should break to the downside in most cases but in this circumstance I don't think it will. If gold continues higher then silver should follow but I really need to see silver break above $20.50 to make this a reality. That said, if silver breaks lower, under $19.75, then the tide may be changing and silver is establishing itself as the leader and gold will likely follow it lower. 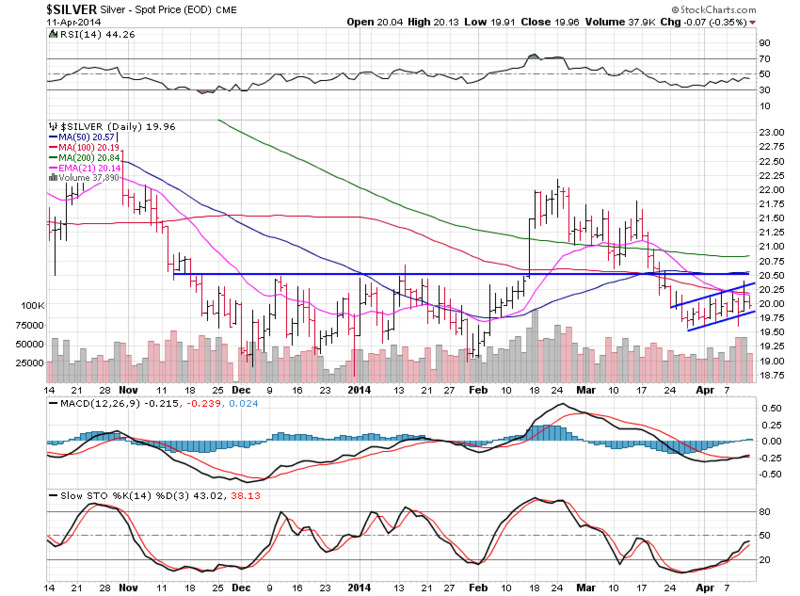 We're at a critical juncture here and from what I see, I think we will move higher but it doesn't matter what I think. Let's just see what happens as we wait for a good setup one way or the other. It really doesn't matter if things go up or down to me as long as they are moving. We can make money in any environment except when there is very limited movement and volatility. We've got lots of volatility these days. Platinum gained 0.58% and remains looking good for higher prices. We've got a nice uptrend channel here that should take us to $1,490 within two weeks tops. Once we hit $1,490 we will need to rest for a week before we begin the move back up to $1,550. Great action from platinum that is playing out as it should so far but no matter what, if gold begins to tank then platinum will totally fall apart and head lower as well regardless of how good its chart looks. Palladium rose 1.86% as we clear this base for the third time. They say the third times a charm and it is so often in trading so this breakout should be the one to take us back up to all-time highs. The $830 area should see some consolidation since that is monthly closing highs but once we base there we are going to move to all-time highs at $862 before breaking towards the inevitable 1k large round number magnet in time. Just look at the large volume increase on the breakout. Nothing is ever carved in stone, but these are the ingredients needed for a strong and sustained breakout. Be careful in this market still but if you can be quick and nail a few spots you can make some good quick coin while we wait for nice bases to complete. Our best trade this past week was about $50 in one stock in only a couple days and I'm looking specifically at this stock for another pop shortly, along with other fast moving stocks.